Well the pumpkins from last week got their carve on! I am typically horrible at carving pumpkins, you know continually stabbing straight lines until you can punch out the cut. It never worked for me, last years pumpkin was a disaster! This year I tried to carve like the pro’s using my pottery tools and it worked out pretty well. I think reductive anyway from my Printmaking and Sculpture background, yep that’s what I got my degree in….not Photography! This is a rare occasion that you will actually see me in a photo, I am usually behind the camera! I made the image of me carving the pumpkin from one Image taken by my wife, she is actually a pretty dang good photographer. Take a look at the dynamic triangle leading to the focal point, oh crap she is going to get better than me…. I took her image into Photoshop and created a +2, +1, -1, and -2 image and then processed all 5 in Photomatix. I am not crazy about this method, I rarely do it, but here you can see how it came to benefit me. If I could take 5 exposures of myself I would but my camera doesn’t have the timer capability with the bracket enabled. The HDR images turned out exceptionally well, in my opinion. HDR really pulls out those details that are usually missed by a single image, we all know that by now, but I am still amazed by how it renders the grooves in the pumpkin. I have pretty much given up on the single image life, and this is why. If I can see everything in HDR I will! Did I mention that I eat, sleep, and breathe HDR yet? 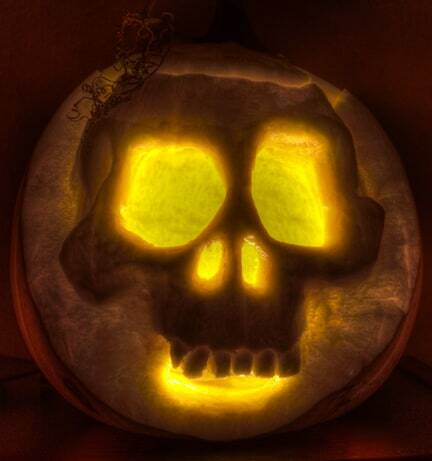 Here is a Pumpkin Texture for you too! This texture I actually HDR’ed and works nicely on images of pumpkins. Go carve a pumpkin this week, and HDR the pics!